Electric carmaker Elon Musk launched their new business venture “solar roof products” on a news conference last October 28 at Universal Studios in California. TESLA is known for manufacturing electric vehicles and is popular on upscale and mainstream markets. According to the company founder, global warming is a serious catastrophe and we need to do something about it. He added that their automobiles were popular among Hollywood Stars and Entrepreneurs because it looks good and environment friendly so they thought that solar roofs deserve a transformation to make them as appealing as electric cars. There were solar panels installed in roofs before but they are not exquisitely pleasing meanwhile TESLA’s Roof Tiles are made of strong tempered glass that resemble traditional roofs without noticing that your home is powered through solar energy. Musk also revealed that their goals are to make solar roofs look better than ordinary roofs, produce electricity, and has better insulation. In June, TESLA offered Solar City, which is the largest home solar panel installer in America, to buy their stocks worth $2.45 billion and will finalize on November 17 however their planned to merge became controversial because the company neither achieved profit sustainability nor the demand in markets are uncertain. Some shareholders even sued Musk who is also the chairman of Solar City for they claim that it is his way to use one company to bail out another. The CEO called the deal a “no brainer” by saying that TESLA’s global stores and Solar City’s installation network can provide their customers in a one-stop shop for them to save energy and transportation. If their deal will push through, Solar City will adopt TESLA’s name and to sell the solar panels and power-storing batteries. 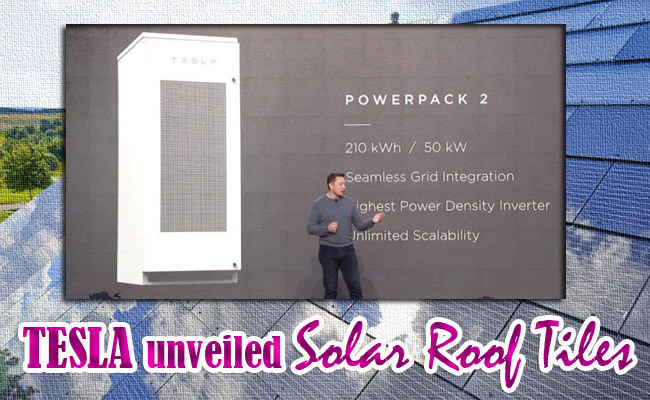 Aside from Solar Roofs, Musk also introduced an updated version of Powerwall, a built-in power inverter that provide energy in homes and business.